So it seems that Blogger ate my comments from my most recent post. (Please regurgitate them, blogger! please?) But that's besides the point. Today is one hectic day--I just attended a community women's brunch (where I won a sushi set, woohoo! ), and I have two more events to hit up today. Not to mention exercising, menu planning, and laundry. So I'll keep this short and sweet! 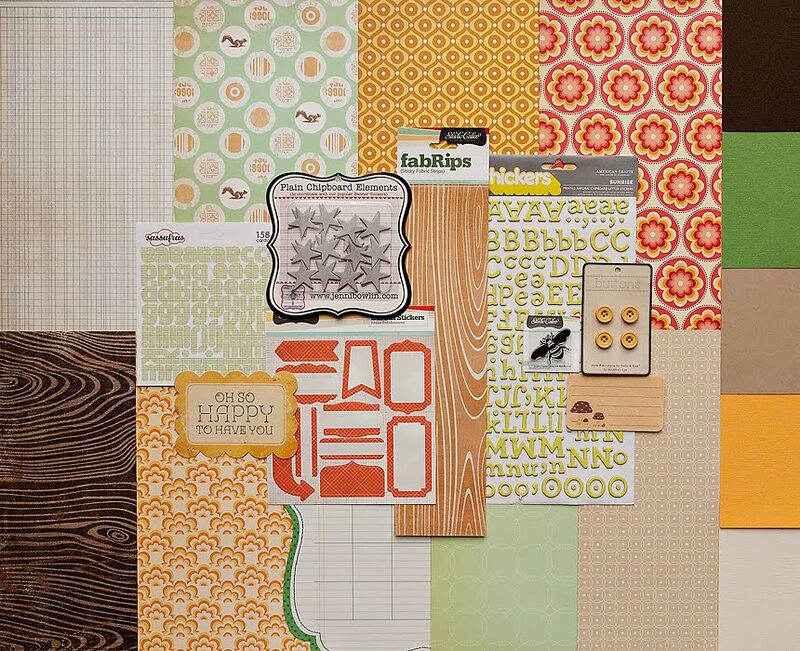 I created this layout with the Studio Calico March kit, Into the Woods. 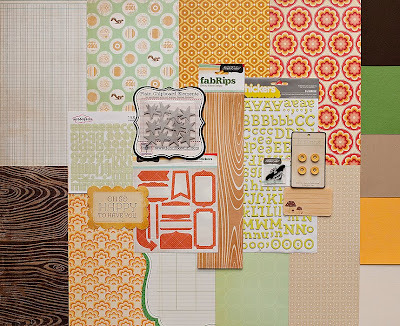 The colors in this kit aren't my usual--very earthy, with lots of pops of green and orange. But that's what I love about working with kits! I work with a much wider range of colors than what I would choose my own (which would be pink....and yellow.....and aqua:)). Since the kit had a more earthy tone to it, I decided to finally scrap the "old time style" sepia photos we had from Hershey Park. I love the KI Memories calendar papers (and had an extra sheet to play with), so I used it as my background paper on this layout. I then pleated and stapled the woodgrain fabric strip, layered the labels and stickers, and added the final touches. I misted the chipboard stars to add more color. What is YOUR favorite layout right now? Link me up! I love that page and those pics are awesome! Those calendar pages were the stuff for sure. Here is a new fave, it's a page I made about getting published in ST and a story they did about it in my local paper. Love all the green here. Still trying to figure out how to make best use of that paper. My favourite LO... hmmm, right right now, one I did today that's not quite finished that I'll try to post in the coming week. Your layout makes me smile and chuckle! Looks like you two had a great time. :-) Love the hat! Thanks for sharing! love those photos! The layout is beautiful! What a fun layout! I love the colors and your photos are super cute! Rotten blogger! I had left a comment asking a question about a piece of furniture!! LOL...not to worry!! your layout is fabulous! love the whole feel of it! !..the colours blend perfectly! and similarly to yours, colours aren't my usual style and had to edit photos to match! This layout makes me smile! I love the fun photos and the title, simply fabulous! LOVE! i have yet to really break into that kit! Great layout - and I love the photo! 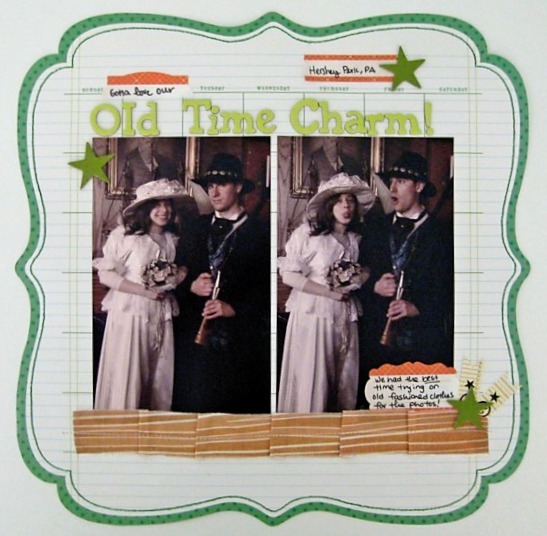 Hubby and I did one of those "old tyme" photos, too....such a blast! i love the photos on there!!! how fun!! Such awesome photos, very fun!